Shaydeangel3, try disabling the custom cursor from the Options menu, or changing from full screen to windowed mode (or vice versa) to see if that helps you. doowats, it sounds like this is a gameplay question. I'd recommend checking out the Criminal Minds Walkthrough or create a new thread in this game's Forum for further hints and tips. Okay, I am stuck at the biker bar trying to compare the pictures to the patches and no matter how many times I stick the pictures to that area nothing comes up!!!!???? I have tried several spots, have closed the game and reopened.....next trick is to reboot, and then delete and reload the game. But before I do that, i would like to know if this is a game malfunction (since I have not seen it here in the technical issues area-I'm not sure)??? HELP...I cannot proceed with the game until this issue is resolved. THANKS!!! • Return to the saloon and use the SURVEILLANCE PICTURES on the wall . • Find the patches from the pictures in order. Each picture will show one of the patches in this scene; find it to move to the next one. • See the screenshot for the positions and the correct order (1-8). If you're having trouble with clicking on certain items in the game, try disabling the custom cursor from the Options menu and see how you get on. If you post in the Forums, it helps to keep on checking back to see if anyone replied to your question. You can check your My Messages on the right side to navigate to those threads. I am unable to insert the cassette tape in the machine (for interrogation). No matter where I click, it won't let me put it in. I have tried both the single tape and the bunch of tapes. walkthru shows section e in room located in the biker bar. There is no section e, so I can not get the rope or the combination for the locker. I have moused all over that room. Can get everything but the hidden area for section e.
Solved the problem. Had to put the lab coat that I found into the closet. Then the closet door shut and section e area was there. That really made sense. Love these games, so now I am going to go and get a class of wine. I purchased the game & am at a standstill, I have been on this one spot for hours!! I am trying to get the necklace, I have reviewed the walkthrough over & over, where it says it is placed, rossi's head is in the way & how do you move him so I can find the necklace?? this is very frustrating because it is largely the beginning of the game & I can't go forward if I don't find the necklace, & according to the walkthrough it is under the sign for the art square party, any suggestions on how to move rossi so i can look under the sign like the picture in the walkthrough?? 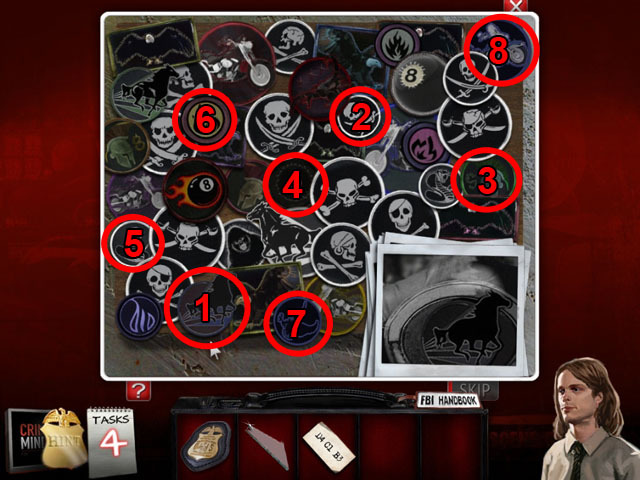 Someone previously posted problems with not getting the scissors outside the victims house in case 1 - I have tried restarting the game 4 times now, I even uninstalled and then installed it again, but either way, no matter how many times I find those damn scissors, they do not get in my briefcase. Just downloaded CM on my Mac with ML. I can only play in windowed mode. It doesn't go to full screenand the screen on both sides flashes continually. dakini wrote: Just downloaded CM on my Mac with ML. I can only play in windowed mode. It doesn't go to full screenand the screen on both sides flashes continually. Having the same problem on my iMac. hi, i posted a technical issue under another forum topic; [i]game 1 community center, which is about 5th on the list of topics, regarding not being able to get into the center after completing the puzzle. I emailed tech support as well, and have not received an answer, so am stuck on the game. help please? I am having trouble getting into the community center door. The spot glitters up and the door is open but when I click on it I cannot enter it is the only thing left I have done everything else and now I am stuck I have tried everything. The issue I am having is in game two - I picked up the flash drive on the plane but when I got to the interrogation scene it is not there for me to use on the laptop. I cannot find a way to get back to the plane either to try and pick it up again if that is possible. I had to play the game windowed in Mac Mountain Lion. Works fine windowed but in full screen you end up with two bars on either side of the game that are garbled up pixelated versions of what was on the desktop before starting the app. I already played it but was wondering if anyone else might have found a solution to this. It's a shame it would not go full screen... makes it harder to see things. I attempted to reduce my resolution from 1920 down to something ridiculously huge ... 1024x768 and it had no effect on the problem. I can't zoom in on the door in the Community Center to use the glass cutter to open the door ~ and I can't go any further in the search. eedebeep wrote: I am unable to insert the cassette tape in the machine (for interrogation). No matter where I click, it won't let me put it in. I have tried both the single tape and the bunch of tapes. You have to do the 'fit the tapes into the box' puzzle in the lobby to get the blank tape. Then you bring that tape into the computer room and put it into the cassette player. I'm stuck on trying to get a door open with a glass cutter ~ the game won't zoom in on the door for me. I tried disabling the custom cursor ~ that didn't work either. I have a brand, brand, brand new Mac ~ running the latest OSX ~ I think it's Mountain Lion and there are two programs that I use, SnapzProX and WireTapStudio by Ambrosia, that say they have to update the programs for all the program options to work in the new operating system. Perhaps that is what is happening with this game? I collect the pen drive, put in the notebook of militia and read the email and push the Print Button. After that I'm not able to do anything. It supposed to have the e-mail in the printer and never find. Could you please help me? I just can't get the file to give to the cop in the room. I am trying to use the glass cutter on the door to open it, but the game never zooms in on the door and the glass cutter just goes back into my inventory when I try to use it without the zoom. I can't continue on in the game without getting that door open. I guess we're not getting any more technical help here.